Each email address can only be associated with one Databox User. The steps below outline how to add a user to multiple Databox Accounts. If you're attempting to add a new User in an existing Databox Account, you'll receive the following message if the email address is already associated with a User in the Databox system. In most cases, the User created a standalone Free Account by mistake. If you're attempting to create a new Databox Account, you'll receive the following message if the email address is already associated with a User in the Databox system. Since it's already been determined that the User does not need access to the old Account, the first step is to disassociate the email address with that Account. Below are 3 ways to disassociate the email address from the old Account. Change the User's email address in the old Account: In order to do this, you have to be logged in as the User whose email address you're changing. Follow these steps to change a User's email address in Databox. Delete the User from the old Account: The Account Owner or Admins in the old Account can delete a User by navigating to the User Management page in Databox. Delete the old Account: If you don't need an Account anymore or you've created it by mistake, we can permanently delete that Account. Email [email protected] and we'll process this for you. The message must be sent from the email address that the request is for. If you are using a Google-based email solution like Gmail, then this can be done using the “+” operator. Your email service will read the "+" and ignore anything after it, so you will still receive all emails sent to this address. However, Databox will register this as a unique email address, which allows it to be associated with multiple Users in Databox. For example, the email address "[email protected]" is registered as a different address than "[email protected]" by the Databox system. Therefore, "[email protected]" can be successfully added to Databox Account 2 while "[email protected]" is already a User in Databox Account 1. Any emails sent to "[email protected]" will go to the inbox of "[email protected]"
Once the User has been added to the Databox Account, they will receive an email with their login credentials. After the User accepts the invitation they will be successfully added as a User in the Databox Account. Note: You can replace the text after the "+" operator with anything you want. For example: "[email protected]" or "[email protected]"
If you are using a Microsoft 365 email server and have admin permissions, you can create an Alias in order to add the same User to multiple Databox Accounts. You can create up to 400 aliases for a Microsoft 365 user. No additional fees or licenses are required. Alias's can only be created by Office 365 global admins who have Business subscriptions. Note: If you receive an error message saying "A parameter cannot be found that matches parameter name 'EmailAddresses'," it means that it's taking a bit longer to finish setting up your tenant or your custom domain (if you recently added one). The setup process can take up to 4 hours to complete. If the problem persists, contact Microsoft's Support Team to request a full sync. In the text box under "Alias," type the first part of the new email alias. For example, if your new email alias is "[email protected]" you would enter "john2" in the Alias text box. If you added your own domain to Office 365, select your Domain for the new email alias from the drop-down list. Click Add to create the new Alias. 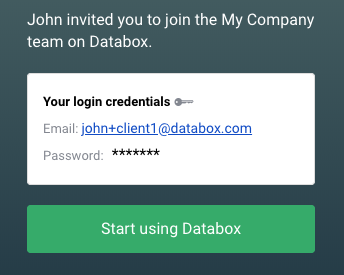 Signup or Invite a New User in Databox using the User's new Alias.